We chose argan oil as our main ingredient after experiencing it's amazing skin benefits and learning about the rich history. Argan oil is truly a fantastic, multi-faceted, multi-use, multi-skin-type product which is why we couldn't deny centering an entire natural skin care line around it. As of that weren't enough, it's produced in a way, and by a people that we feel priveleged to support. 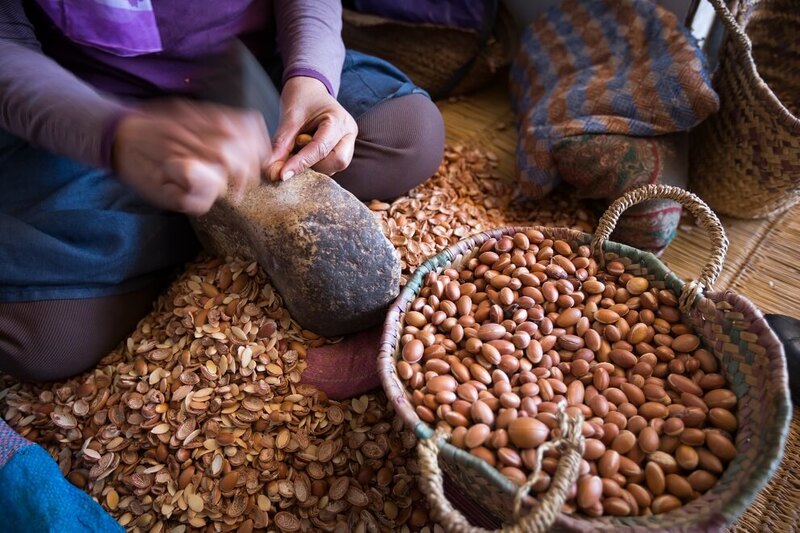 The argan oil itself is produced by first picking the fruits and drying them in the sun. 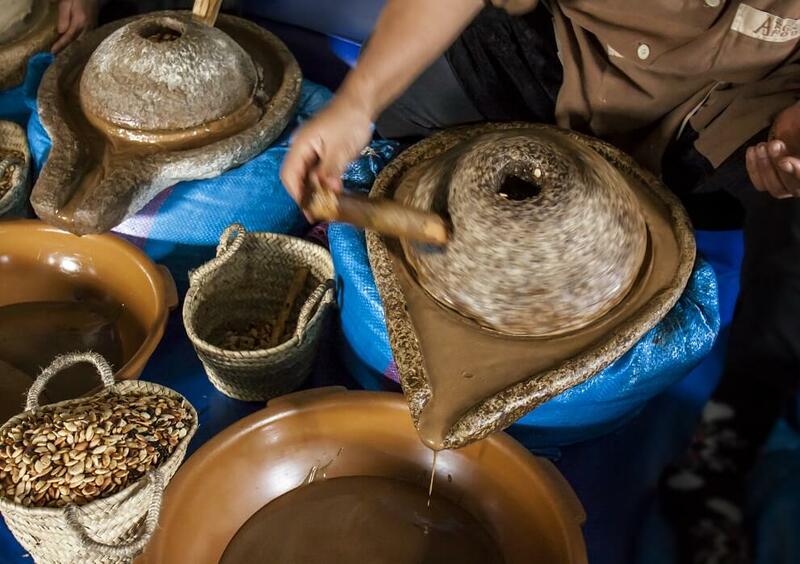 Then, the thick skin of the argan fruit is removed, as well as the pulp to reveal the nut in its center. The fantastic argan nut is then hand-cracked with stones and pressed to extract beautiful, beneficial and pure argan oil. The flesh of the fruit and the remainder of the ground seeds are used as animal feed, so there is very little waste. Though there are some large capacity facilities, often these processes are still performed by hand in Morocco using only basic tools, and usually by women. I proudly support those women who perform these arduous tasks to better themselves and their families in a very male-dominated country. 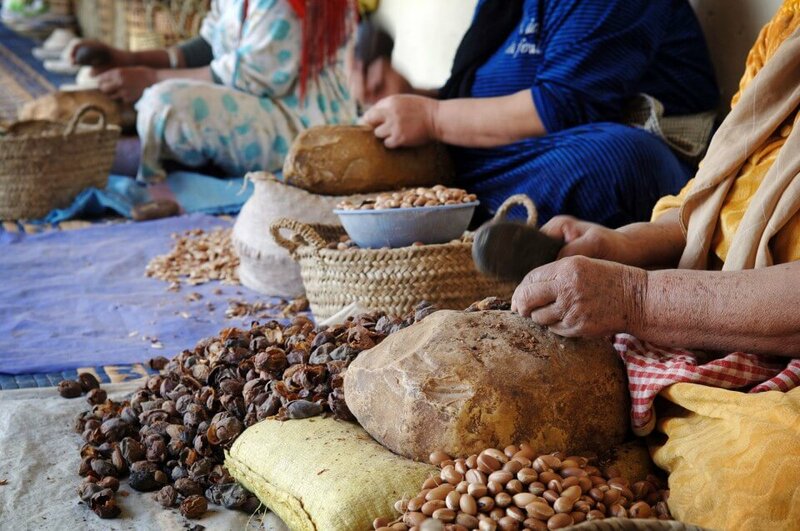 Even the large argan oil facilities are located in the production region and comprised of a mostly female workforce. In Morocco, argan oil is used regularly as a dip for breads and salad dressings due to its nutty flavor and healthy fatty acid content. Much like olive oil, consumption of argan oil has been associated with combating obesity, cardiovascular diseases, and cancer prevention. Argan oil has so many wonderful benefits for skin and hair care. It has always been used by the indigenous Berbers of the region as a skin moisturizer and protectant from sun and wind damage. 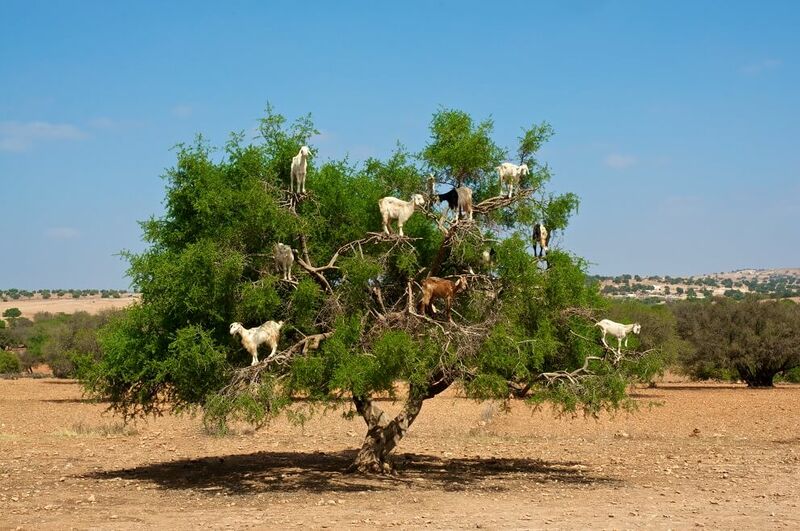 It is only recently that argan oil has come to the West and appreciated for its power to soothe and heal. Argan oil’s high linoleic acid content reduces inflammation caused by acne, infections, rashes, and bug bites. People with acne-prone skin tend to have a low percentage of linoleic acid compared to their oleic acid level in their natural skin oil. Studies have shown that increasing the amount of linoleic acid in the skin will reduce acne, especially the small pimples known as micrcomedones. Argan oil is also non-comedogenic, meaning it will not clog pores. Argan oil is highly anti-inflammatory and will help ease eczema, psoriasis, acne and sensitivity issues. Use argan oil in combination with essential oils such as blue tansy or chamomile to achieve the best possible skin soothing results. 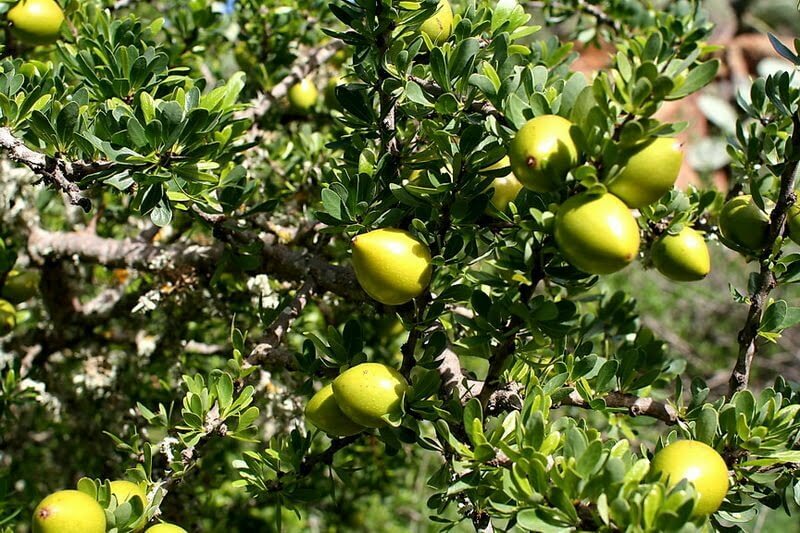 High levels of vitamins A and E in argan oil rejuvenate and promote restoration. Tocopherol, found in vitamin E, increases cell production to create an “anti-aging” effect. Elasticity of the skin is improved, and when argan oil is used as a body moisturizer, you can avoid and reduce stretch marks. A day in the sun can destroy much of the skin’s natural vitamin E content, but an application of argan oil before and after will block the UV light from damaging your skin. Vitamin A is fantastic at reducing wrinkles and smoothing rough skin. However, strong sunlight can inactivate many forms of vitamin A, so make sure you apply before bedtime to maximize your benefits. Additionally, the high content of linoleic acid can help reverse those dark sun-spots on the face. Argan oil can improve and prevent stretch marks by promoting skin elasticity and suppleness. 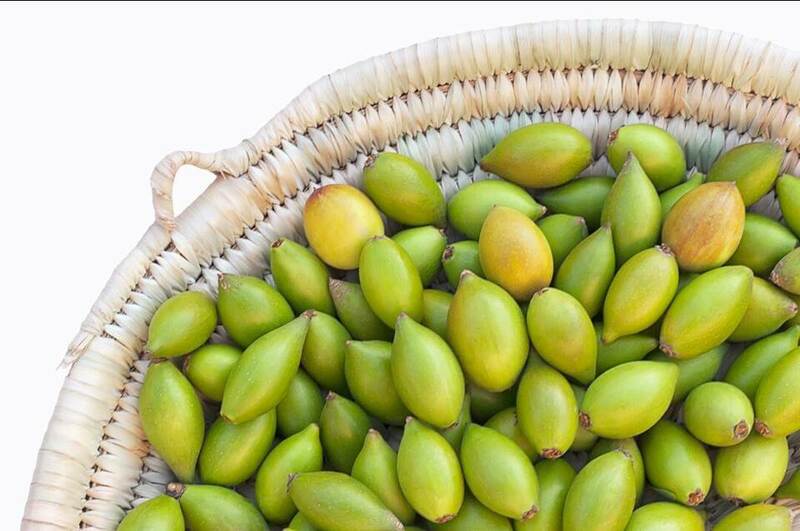 Rub argan oil on areas that are prone to stretch marks, such as belly, hips and thighs. Doing so regularly can prevent stretch marks and the overall condition of your skin. Use argan oil as a post shave balm for men or women on face and body to combat ingrown hairs. Argan oil is a deeply penetrating moisturizer that doesn't clog pores or leave you with a greasy feeling. Rub a drop of argan oil on nails and cuticles to heal and prevent hangnails. Moisturize the cracked skin on knuckles and heels overnight. Argan oil provides moisture, prevents breakage, and enhances shine and texture. Use it as a leave-in conditioner to keep frizz at bay and protect from the heat of blow dryers and curling irons. Or, apply even more before bed as a deep conditioning treatment and wake up to a hydrated scalp and restored shine. Because of its many applications, relative scarcity, and, of course, its beautiful color, argan oil is aptly named “Liquid Gold”. 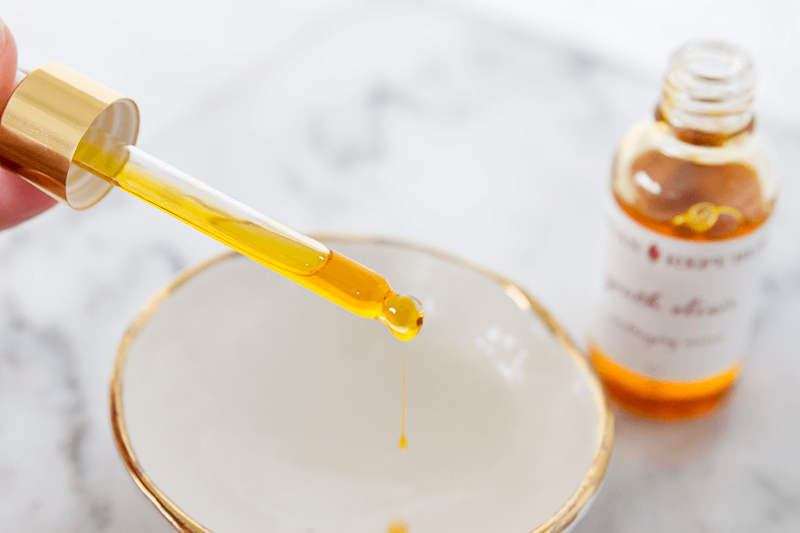 When combined with other gifts from nature such as rose extracts, prickly pear, tea tree, and lavender, argan oil’s effects can be supercharged to become the perfect application for any skin ailment. Argan Republic meticulously sources, formulates, and combines the best ingredients on earth to create magical skin and hair products. There is no need for harsh man made chemicals or addatives, when nature has provided such amazing, unaltered, sustainable cures that grow right alongside us. Argan oil is a skin care game-changer and will prove itself to be an indispensable part of your skincare routine. A cleansing oil is a way to naturally deep clean your skin, removing impurities, toxins and unclogging pores. 60 drops Organic Essential oils. I suggest using essential oils that have detoxifying properties such as ginger, lemongrass and juniper. Rub down the inside of your bowl and entire spoon with rubbing alcohol. Make sure they dry completely before you begin. This will kill any bacteria that was lingering, we don't want any bacteria or moisture finding its way into your product because that can reduce the shelf-life. Mix all ingredients well, carefully pour into your bottle and voila! Pump a dime sized amount of oil into the palm of your hand, rub both hands together to warm the oil and apply to your face, massaging deep into your pores to dissolve impurities. Focus on your problem areas and take your time, letting the oil work in deeply to loosen debris and hardened sebum. Run your washcloth under hot water and wring it out letting it cool a bit but still steamy and warm. Gently hold the washcloth over your face and let the warmth penetrate your pores before wiping and repeating 2-3 times. There's no need to scrub with this method as the oil and steam do all the heavy lifting. Once you've finished, apply a tad more of your favorite serum or oil and enjoy the glow. This is a deep cleaning method and should be done only every few days to avoid drying. Your skin may start to show signs of detoxification with a breakout here or there but will soon transform into glowing clear skin.